My name is Stephen Ditta and once again I am back with a really cool assignment! I have been working a sketch, the character is named Hawkeye. I have worked on this assignment for a total of approximately 20 hours inking and 5 hours colouring, I was super dedicated to this piece of art. I want to sincerely thank Steven Sanchez for letting me use his amazing drawing of Hawkeye. If you want to see more of his art check it out here at http://stevensanchez.deviantart.com/. 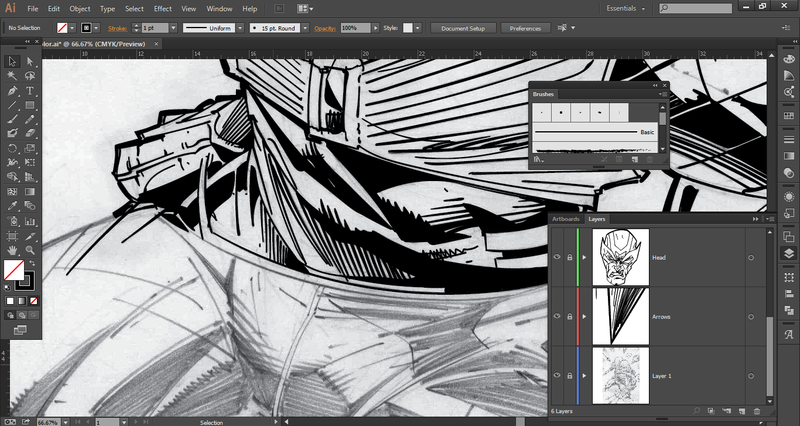 I first started this sketch by inking some lines to get the feel for using the pen tool on illustrator. It took a while to make the lines because I was deciding what to trace and what not to trace. I wanted to make sure the art still looked aesthetically pleasing. Once I did that I practiced with other images online to get a better feel to how the tracings should look. Once I felt comfortable I started with the most important part, “the head”. I made sure that I put the most time into this part of the sketch, as it is the first thing the viewer looks at. After completing the head I moved onto the arm. 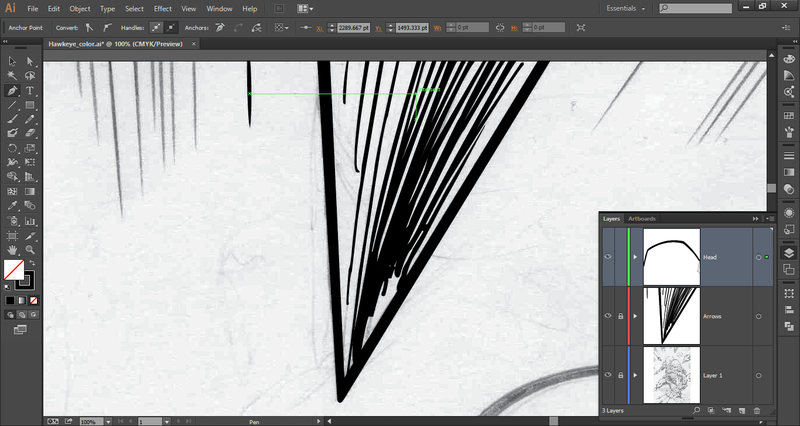 After a couple of lessons with the Wacom tablet in-class and on my own time I started to take interest in it. 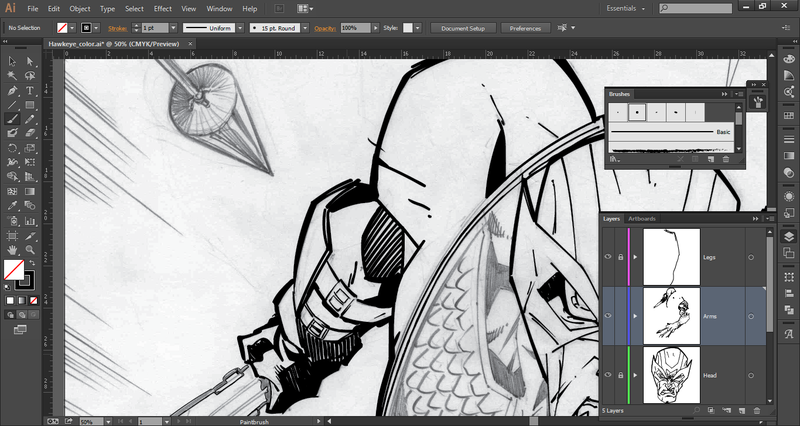 I switched to the Wacom tablet finishing the right arm of Hawkeye and boy did I ever feel proud. Once I finished the right arm I sort of fell into a parade of assignments that held me back a couple of days from continuing this assignment; however, I managed to plough through the assignments getting back on track. The left arm of Hawkeye took me a while to do as it had lots to shade in. But, once finishing from the torso up I felt a sense of satisfaction. It started to piece together and look amazing. Finally I finished off the piece by sketching the legs as well as the foreground. This was the final inked sketch that I completed. 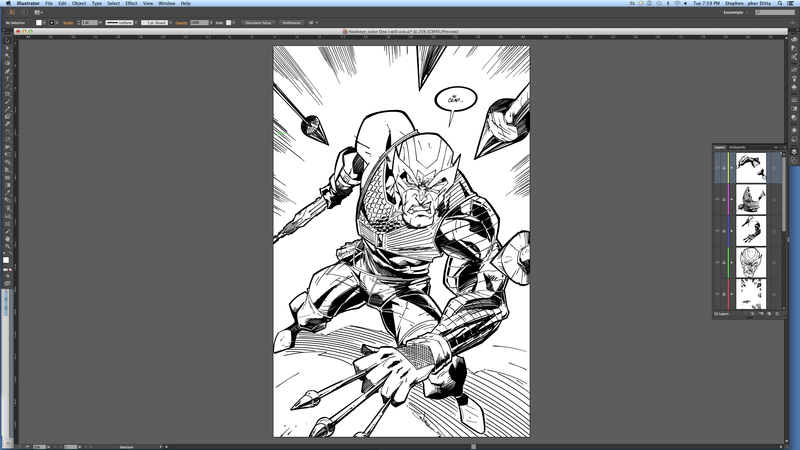 Lastly was the colouring part, and boy was it ever fun. I started with a whole bunch of ideas for colours as well as looking up references as to what colours Hawkeye proudly wears. I created this first coloured sketch of Hawkeye, but I was not feeling the colours, they were just too dark in my opinion. 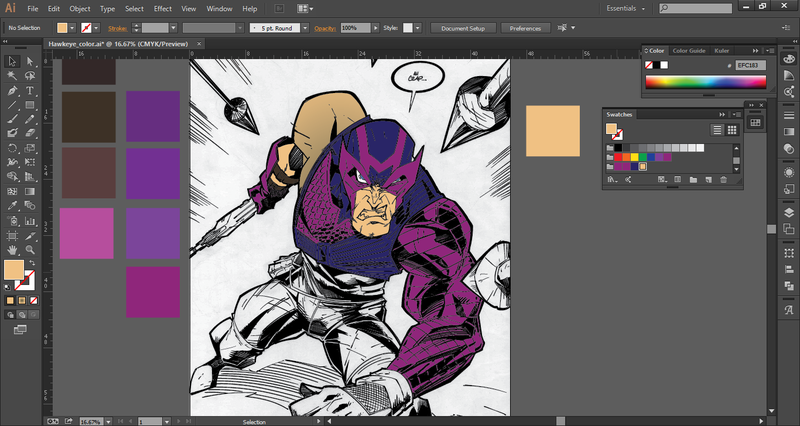 I wanted it to look more like the original Hawkeye which used lighter colours. Finally achieving this as my final piece. Once again I want to thank Steven Sanchez for giving me the opportunity to ink and colour his work. I really enjoyed creating this piece of art. Until next time.